The game is loosely based on the rules of football, but adds teleportation and special abilities, often being described as “FIFA with teleporting”. The main thematic inspirations for the game are Speedball 2, Monday Night Combat and Cellfactor: Psychokinetic Wars. Online and local multiplayer: WarpBall is best played with friends, and you can play with them whether they’re in the same room as you or not! Character Customisation: Combine any character model, skin and ability to create an avatar that’s truly yours. With procedurally generated skins, your loadouts can be truly unique. Easy to pick up: The basics of WarpBall are fast to pick up, although the game’s depth takes time to master! When playing a standard 2v2 match, players are able to teleport the ball to their team-mate’s feet, so long as their teammate is behind them (like the rules of passing in rugby). This technique, known as a WarpPass makes tactical positioning of both team members even more important. The user can place a special ghost that they can choose to teleport back to over the next few seconds. Users can even snap back to their ghost’s position when carrying the ball. The user can activate a special warp that can also teleport the ball if it’s in the path of travel. While players still can’t use this warp when carrying the ball, they can use it to steal the ball from an opponent. Knocks away all opponents nearby, as well as sending the ball flying away from you. Nothing’s more satisfying than knocking down both your opponents with a well timed blast! We’re very excited to be working with the Outtalectuals to source a full 20-track album for WarpBall, from some of their amazing artists. The track used in all our trailers, Kermode’s Interdiciplinary is the first of the many tracks that’ll be appearing in the game. We’re also working on a little something else, but it’s far to early to announce anything about that yet. We’ve been running a closed alpha over the last month, and are getting ready for getting the game into more people’s hands to test it and improve it! 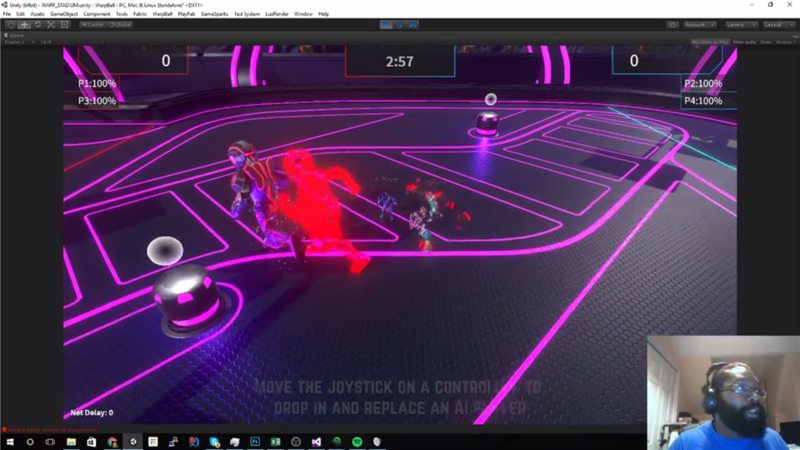 Both online and local multiplayer gameplay for the first 5 abilities, and first arena is complete, and we have concept art for the new arenas! We hope to release during Q1 2017, and after the final features are finished, the time until then will be spent adding new content to the game (more arenas, modes, abilities and characters). Unruly Attractions is only a indie micro studio, but every member and contributor is passionate and super talented. WarpBall is a much more ambitious project that our previous work, Standpoint, and we want to make the game with help from fans and crowd-funding community member, to make sure that we make the game you guys want to play (and we want to play!). With $20,000, we’ll be able to stay independent, make WarpBall the best project it can be, plus deliver you guys some cool rewards too! Any additional funds will be used on expanding the initial release with extra characters, arenas and abilities! First Update, First $1K, and Merch Sample!! The campaign hasn’t been live for long and we’ve already hit our first $1k! We’re so excited to be launching this campaign with PixelFunder, and are looking forward to hearing more from you all. Make sure you follow us on Twitter and Facebook, as during the PixelFunder campaign, we’ll be running a few competitions, handing out alpha keys to the winners! So were you wondering about the pixel charms that come with the Die-Hard Fan tiers and above? 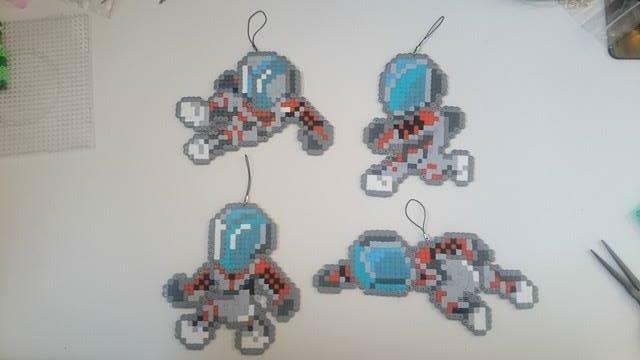 They’re made by the talented Kendal James, a UK Pixel and Hama bead artist. Here’s a picture of the four patterns that she designed for us! It’s been a long time coming but we’re getting back on top of our Update game! The last weeks, we’ve been doing a LOT, both to do with development and showing the game at various events. From the back of that, some good news is that we managed to secure some external funding, allowing us to cut down our target funding goal from $40k down to $20k, which is really exciting for us! Next week we’ll be at the London GamerDisco @ The Book Club, so for any of you London based WarpBallers, be sure to swing by. We’ll be showing off the new Defender class for the first time, with their “Growth” and “Wall Deployment” abilities! After that event we’ll be pushing the defender patch live, so that any alpha-access players can play around! Speaking of the Defender class, be sure to tune in to Vethan’s weekly wednesday streams to check out the game’s development, and help influence the abilities yourselves! He regularly hands out keys for the alpha in stream, so even more reason to check in! I am really excited about the new Defender character!